A church's name is meaningful because it conveys important information. From its name, we learn about the identity of believers and how they express their relationship to the divine. A name can also tell us how a church distinguishes itself from other similar faiths. In 1830, as Joseph Smith's revelations became scriptures and people warmed to this new testament, it became clear that his fledgling faith community needed a name. Joseph and early Church leaders looked to the Book of Mormon for guidance. For devout Mormons, the name of The Church of Jesus Christ of Latter-day Saints results from divine revelation, from the Word of God as communicated to his chosen prophet, Joseph Smith. The name reinforces the unique and instrumental role Latter-day Saints play in the restoration of the church: "The Church of Jesus Christ of Latter-day Saints is the Lord's kingdom once again established on the earth, preparatory to the Second Coming of the Messiah." For members, the Church's name signifies the community's special responsibility, and it designates the crucial role every member, or saint, has in bringing about God's kingdom. Name alterations occurring in its early years indicate Church leaders' inspired efforts to transmit the intentions of God in human language. Working with the contemporary primary sources, historians have noted a lack of clarity concerning the reason for these name changes. There is also scant reliable information documenting the decision-making processes followed by early Church leaders. One fact that appears indisputable is that name changes resulted from human, not divine, intervention. For critics, these alterations are from the acts and intentions of humans motivated by perhaps social, political, and economic objectives. "Introduction," Book of Mormon. Link is here. We, as Latter-day Saints, often cite the name of the church as an indication that the LDS Church is truly God's one, true church. We often say things like the Lutheran Church can't be God's church because it is named after a man, Martin Luther. The word 'Catholic' just means universal. Baptists are said to be named after John the Baptist. The true church must be named after Christ, thus the official name "The Church of Jesus Christ of Latter-day Saints". The Latter-day part added to show that it is not the original church that Christ established around 30 AD, but rather Christ's restored church in this dispensation. 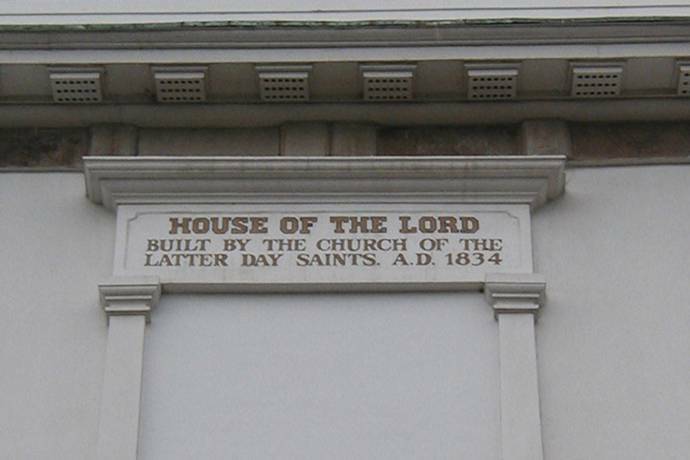 The LDS Church did not always have the name "The Church of Jesus Christ of Latter-day Saints". On April 6, 1830, LDS church leaders met together presumably to fulfill the requirements of the laws of the land, and they named their church consistent with the admonition of the Book of Mormon, "The Church of Christ." On May 3, 1834, Joseph Smith, as moderator, made a motion to change the name of the church to, "The Church of the Latter Day Saints," which was adopted by unanimous vote (The Evening and Morning Star, vol. 2, no. 20, p. 160, May 1834; History of the Church 2:62). He took CHRIST right out of the name! Four years later, on April 26, 1838, it was again changed to "The Church of Jesus Christ of Latter Day Saints" and has remained thus since. (The hyphen in 'Latter-day' was add about a century or so later to be grammatically correct). Why did Joseph change the Name of the Church after God already told him 4 years before what to name it? "In June, 1829, the Lord gave us the name by which we must call the church, being the same as He gave the Nephites. We obeyed His commandment, and called it The Church of Christ until 1834, when, through the influence of Sydney Rigdon, the name of the church was changed to The Church of the Latter Day Saints, dropping out the name of Christ entirely..." (An Address to All Believers In Christ Whitmer, p. 73). Now to be called the Church of Jesus Christ of Latter-day Saints (LDS). The following photograph of the Kirtland temple still bears the name 'The Church of the Latter Day Saints'. If we are to use the rule found in Third Nephi 27, are we then to assume that the church the Apostle Paul addresses in 1 Thessalonians 1:1 was in a state of apostasy? After all, Paul refers to it as "the church of the Thessalonians"! Consider also that Paul refers to the body of believers in Corinth as "the church of God which is at Corinth" (See 1 Corinthians 1:2). We regret that we could not find this issue discussed comprehensively in any church publication or website. However we found several responses from LDS apologists and LDS leaders which we cite below. Richard Lloyd Anderson, a professor of religion and history at Brigham Young University , attempted to explain the 1834 change. He says, "This alteration was not seen as a de-emphasis of Christ; on the contrary, it was done in hopes that the name of the Church would more clearly reflect the fact that Christ was at its head" (A Sure Foundation, pg. 195). "In June, 1829, the Lord gave us the name by which we must call the church, being the same as he gave the Nephites. We obeyed His commandment, and called it the Church of Christ until 1834, when, through the influence of Sydney Rigdon, the name of the church was changed to `The Church of the Latter Day Saints,' dropping out the name of Christ entirely, that name which we were strictly commanded to call the church by, and which Christ by His own lips makes so plain" (Address to All Believers in Christ, pg. 73). It would be easier for Anderson to admit that the LDS Church spent much of its first decade without having the name of Jesus in its title. Does this make it an apostate church? If the Mormon answers "no," then the argument made today based upon 3 Nephi 27:8 is moot. This name, Anderson adds, is "descriptive of divine restoration" indicating "Jesus is at its head." With obvious pride, Anderson believes that "...the full title, `The Church of Jesus Christ of Latter-day Saints,' is striking by comparison to the names of the scores of churches that obscure their Christianity under the label of their founders or of some characteristic belief or aspect of church organization" (A Sure Foundation, pg. 196). It is hypocritical of Mormons who condemn Christian churches for not having the name of Christ in their official title when their church has not always had that distinction. Also, many other churches use Christ in their name so the LDS Church is hardly unique in that regard including several churches known as the 'Church of Christ' which had that name long before the LDS church was first named in 1830. Much is made of the name of the Church by its missionaries, who claim that there was no church on the face of the earth called "The Church of Jesus Christ" when the "church" was restored in 1830.What is the explanation for the fact that the Church changed its name twice in the first eight years of its existence?According to The Book of Mormon (3 Nephi 27:7-8) it was to be called after Christ's name; and for the first four years, it was called "Church of Christ. "In 1834 the name was changed to "Church of the Latter-day Saints. "Finally, in 1838, it became "The Church of Jesus Christ of Latter-Day Saints. "Wouldn't one think that there is a serious problem of contradiction here, because Jesus made a point to instruct the Nephites on what the Church should be named, and one should reasonably assume that Christ would have informed Joseph in 1830 exactly what he wanted the Church to be called, yet He didn't speak to the point until 1838--after two different names had been used already? The “Church of Christ” was incorporated in New York State in 1830, and employed that name for the first several years of its existence. A letter of the First Presidency of the Church, dated 22 January 1834, noted “the organization of the Church of Christ, or the Church of the Latter-day Saints, on the 6th of April, 1830” (History of the Church 2:22). The following month, we read the “Minutes of the Organization of the High Council of the Church of Christ of Latter-day Saints, Kirtland, February 17, 1834” (History of the Church 2:28), employing a name nearly identical to the one used today. On 3 May 1834, Kirtland was the scene of “a Conference of the Elders of the Church of Christ” at which “a motion was made by Sidney Rigdon, and seconded by Newel K. Whitney, that this Church be known hereafter by the name of ‘The Church of the Latter-day Saints.' Remarks were made by the members, after which the motion passed by unanimous vote” (History of the Church 2:62-63). This name change did not come as a result of revelation, but by vote. Significantly, when the Lord finally did speak in 1838, it was the name he gave the church that became official and has remained so ever since. “For thus shall my church be called in the last days, even The Church of Jesus Christ of Latter-day Saints” (D&C 115:4). The question itself distorts what the Book of Mormon says, by leaving out the context of 3 Nephi 27:7-8. Reading from the beginning of the chapter, we note that the Nephite disciples had already been traveling about, preaching and baptizing, and that when they “were gathered together and were united in mighty prayer and fasting” (vs. 1), Jesus came to them and they asked him “Lord, we will that thou wouldst tell us the name whereby we shall call this church; for there are disputations among the people concerning this matter” (vs. 3). From this, it is clear that Christ did not name the Church he established among the Nephites until after the Church had already begun growing in numbers. This is parallel to what happened in the latter-day Church, when different names were applied until the Lord himself revealed precisely how the Church should be named. In the case of both the Nephite and latter-day Churches, the question of the name was not settled until Christ revealed his will. 1) Even before the Nephite disciples prayed to know how they should call the Church, “they who were baptized in the name of Jesus were called the church of Christ” (3 Nephi 26:21). For some reason, there were disagreements about the precise name that should be used. 2) Latter-day Saints look to the scriptures, not to missionaries, as the final source of truth. Moreover, the name of the Church, while important, is not what makes the Church true or false. When answering the Nephite disciples' questions about the name of the Church, Christ said, “but if it be called in my name then it is my church, if it so be that they are built upon my gospel” (3 Nephi 27:8). Being built on the gospel of Christ and having authority from him is far more important than the name of the Church. Is it reasonable to assume that God would periodically change the name of his church?If Jesus Christ is the central character of God's religion on earth and all things are to be done in his name, is it reasonable to assume that God would instruct his church leaders to entirely leave out the name of Christ from the period of May 3, 1834 to April 26, 1838? If Jesus is really the head of the LDS Church then what possible reason could there be for the name changes? Why would Jesus instruct Joseph as to the name in 1830 then change it in 1834 and then change it again in 1838? Why wouldn't Jesus get it right the first time? We can't understand why he would take the name of Christ completely out of the name of the church for four whole years. One possible reason is that the Church is really run entirely by men without any real instruction or revelation from God. If they couldn't even get the name right for eight years then what else might be wrong? If we take David Whitmer's assertion that Sidney Rigdon helped influence Joseph to change the name of the church, then that causes additional questions to be asked. Why would the prophet of the church, who had formed and already served as president of the church for four years, agree to changing the name merely by having one of his counselors suggest it? This may support some critic's assertions that Sidney Rigdon was a much bigger influence in creating the church than commonly taught. Although the LDS Church's official name is not Mormon and the leadership has done its best to have the world refer to it by the current official name or the name 'Church of Christ', the vast majority of the world still only knows the LDS Church as the 'Mormon Church'. We can't help but wonder if it is really all part of Heavenly Father's divine plan to have his Son's church be known by a nickname? "The Seventeen Straw Men," #2 - The True Church Must Bear the Name of Jesus Christ." Link is here. Forty Years in the Mormon Church (page 81) written by former apostle and member of the First presidency of the RLDS Church (now called Community of Christ) Richard C. Evans.